Leicester City owner Vichai Srivaddhanaprabha was among five people killed in a helicopter crash. Twice, in the space of two-and-a-half years, I have seen the football world left speechless by events in Leicester. On both occasions, it was my job to find some words. The first occasion was on Saturday, May 7, 2016 when little Leicester lifted the Premier League trophy. It was tricky to adequately express the unbridled joy felt by so many, without sounding trite - how do you avoid sounding trite, when the ultimate underdog had triumphed so spectacularly? But really - it was a delightful job. An easy job. The second occasion, was on Saturday, October 27, 2018 when the club's owner was killed in a helicopter crash. Reporting on that has been a very hard job. Impossible to convey the hurt felt by so many. And - of course. One man is at the heart of both stories: Vichai Srivaddhanaprabha. I was in the King Power press room, still evaluating the post-match interviews after Leicester had escaped a drab game against 10-man West Ham with a draw, when West Ham's press officer mentioned there was a rumour outside that a helicopter had crashed outside the stadium. I called my cameraman - Dan Cox - who simply said: "Rob, I saw it come down", and my heart sank. I immediately ran round the front of the stadium, and saw the emergency services flocking towards the corner of the North Stand. As I got there, I could see a huge ball of orange flame, and plumes of thick, grey smoke spiralling into the sky. The helicopter had come down on the outskirts of the staff car park - car park E - less than 100m from where Dan was putting his camera kit away. The fire service quickly put the flames out, but it was instantly obvious to me that there could be no survivors. My background as a news reporter has taught me to watch the body language of the emergency services: once the fire was out, none of them was rushing towards the crash scene. There was no one to rescue. Ambulances that had been scrambled to the site left quietly, with their blue lights off. Whoever was on board had been killed. And like every Leicester fan who knew Kuhn Vichai always travelled to and from games in his helicopter, I knew then that he had gone. Official confirmation of his death didn't come for another 25 hours. But I knew straight away. Everyone knew. I'll be honest, I've been surprised at the level of grief shown by so many. I thought I knew how important Kuhn Vichai was to the club as a whole. But I had no idea how important he was to the wider Leicester community, and also - just how vital he was to Leicester's playing squad. 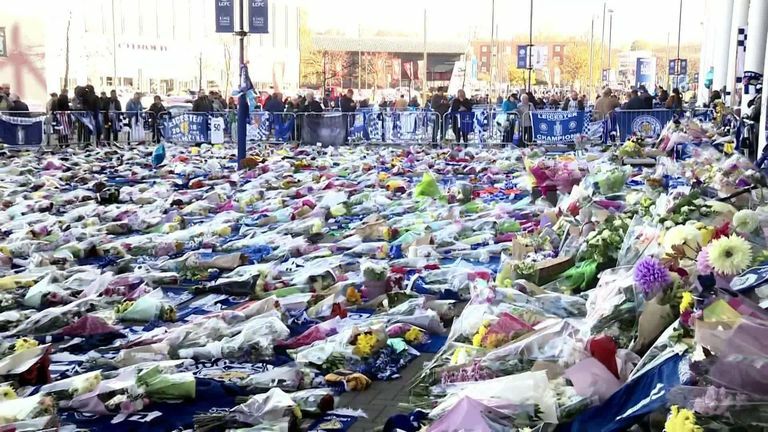 When the players arrived en mass on Monday lunchtime at the ever-growing shrine outside the North Stand of the King Power Stadium, a total silence descended on the already hushed crowds that surrounded the barriers. Since Sunday morning, traffic in the area had been gridlocked with people wanting to come and pay their respects; to lay tributes, to share a private, and yet a mutual moment of grief and reflection. Now, with the squad here, the traffic that had been peeping and jostling for parking spaces on the stadium's perimeter road, stopped. Nothing moved, except the shuffling figures of the players, not daring to look at each other or the crowds, in case they broke down. The players are the focus, the true heart of a football club, and never was this more obvious. After a few minutes of utter stillness, from somewhere at the back of the crowd a ripple of applause began. One by one, the players joined in. The clapping became louder. I saw passengers in the stationary cars joining in. So did the stewards who were marshalling the barriers. Many of the journalists. Even in his death, Vichai had brought unity. I've known Jamie Vardy and Kasper Schmeichel for a very long time. Both of them are huge characters - larger than life. Their personalities dominate whichever scene they are in. Whether that's Schmeichel kicking balls at me while I'm live on the telly, heckling loudly in the background to try to put me off; or Vardy arriving at training, taking great delight in abusing me for my shocking choice of sunglasses, to anyone in earshot. But here, faced with the flowers, scarves, shirts and messages, these two strong, confident, resilient men, were broken. Sporting superstars. Heads bowed. Choking back the tears. I'd been told shortly after the tragedy that Schmeichel had seen the helicopter come down, at 8.37 on Saturday night, and that he'd run towards the burning wreckage to see If he could help. Manager Claude Puel confirmed as much in his news conference on Thursday, without going into detail. That one horrendous story, says so much. Not just about the goalkeeper's courage, but also about his unique relationship with his Chairman. Kasper was the closest of all the Leicester players to Vichai. The two men spent a lot of time together. They enjoyed each other's company. They got on. A few years ago, Vichai loaned Schmeichel his helicopter to get him back to a family holiday quickly, after he had to return for an advertising shoot at the club. How poignant that seems now. Vichai used to seek Kasper's counsel when big decisions were pending. The Dane was accused - wrongly - of playing a role in the decision-making process when Claudio Ranieri was controversially sacked in February 2017 just nine months after Leicester had won the title. But he did have huge influence over Vichai. The two men regularly chatted about performances, styles of play, even tactics. And now, on Monday lunchtime, here was this huge man - physically and metaphorically - reduced to tears. Many of the players have tweeted that Vichai was like a father to them. For Kasper, it was especially the case. In the immediate aftermath of the crash, he was the last player standing. He stayed at the King Power Stadium until the early hours of the morning, consoling other members of staff, sharing the grief of Vichai's closest friends and associates. He was the first to address his team-mates, at the training ground on Monday, calling on them to keep delivering Vichai's vision. For all this, he's grown still further in the hearts of the Leicester fans. And those Leicester supporters. Just as they've celebrated the most extraordinary of sporting achievements, so have they endured the worst of times. Some clubs wend their way quietly through time, without too many highs and lows. Some clubs seem to be forever in the headlines. For Leicester, it's the latter. The club fell into League One in 2008, and was in administration in 2002. When Srivaddhanaprabha bought the club from Milan Mandaric in 2010, a new dawn was promised. He immediately wiped out £103m of loans, bought the stadium on behalf of the club, and began to invest in the playing squad. In a very rare interview at the very start, he said he wanted to be in the Champions League within a few years. People scoffed. Myself included. Here was a foreign owner, investing in an English football club because, in his own words, the team's kit matched his company's colours. And now he was professing to become one of the top four clubs in England? Ridiculous. Two promotions followed and then Leicester won the Premier League in 2016, despite being 5000/1 no-hopers. And now this. A tragedy which most onlookers agree is the worst moment in Leicester City's 134-year history. The scene at the King Power is extraordinary. The shrine stretches now along the entire perimeter of the North Stand, and round the corner with the East Stand. The people, the tributes, just keep on coming. Members of Leicestershire Fire and Rescue came to lay a wreath; they were applauded by other mourners for their efforts to rescue Vichai and the four other people who died. Leicester's longest-serving player, Andy King, came and paid his respects; so did former player and title winner Danny Drinkwater. Vardy and his wife Rebecca came too, the day after the squad had been to the shrine together. Both were in tears. They held hands, as they delivered a box of 100 blue roses, along with a photo of Vichai at their wedding. One of the most poignant images came on Thursday lunchtime. Claudio Ranieri had never returned to the King Power Stadium, since being sacked. But now - 20 months later - here he was, with his wife, paying a heartfelt tribute to the man who had sacked him, flanked by Vichai's son, Aiyawatt, and his widow, Aimon. Aiyawatt and Claudio embraced. People next to me in the small crowd gasped. They knew, it was a scene laced with meaning. Despite their differences, Ranieri and Srivaddhanaprabha had remained close friends. As had Nigel Pearson - another manager sacked (twice, but once re-instated) by Vichai, but who also felt moved to come and pay a personal tribute this week. That speaks volumes of the man from Thailand - even those he crossed in business, who suffered by his decisions, had a deep affection for him. Such was Vichai's humanity. I won't pretend I knew Vichai well. I didn't. In eight years, the number of times I spoke to him, I can count on one hand. The chats never lasted more than 30 seconds, and were never insightful. He was a humble, quiet man who shunned the limelight. But an encounter with Vichai was always charming and endearing; the man forever had a smile on his face, a warm handshake and a twinkle in his eye. I never interviewed him. Despite countless requests. But whenever he was in public, he had time for everyone. Gentle and approachable, I often noticed that he spoke to the stadium cleaners in the same way he addressed visiting VIPs from other clubs. And there was so much he did that was never publicised. Yes, he has consistently paid for buses to subsidise away trips for fans, and given free beer and scarves to all. It's true that he donated £1m to the Leicester Royal Infirmary. Twice. And a similar sum to the University of Leicester. For sure, he gave each of the first team players who won the title a BMW i8 worth £100,000 and their families an all-expenses-paid holiday in Thailand. Claude Puel even revealed this week that Vichai had loaned him his yacht in the summer for a family holiday. But beyond all these grand gestures, were a host of smaller ones. Several Leicester fans approached me this week with tales of his generosity. One man who didn't want to talk on camera, told me this week his son has colitis, and when Vichai heard that he was in hospital for his birthday, he sent along Iheanacho, N'didi and Schmeichel after training for a surprise hospital visit, together with presents, toys and party games, as a birthday treat. No headlines. The story never came out. Just Vichai. Never before in my 22-year career have so many people come up to me and thanked me for our coverage. More than 100. I mention that not as a boast, but as an example of just how many people have been affected by this story. How many people were affected by Vichai. And I have been too. Without him, I'm convinced the greatest moment in my journalistic career would not have happened. Leicester won the Premier League title. Leicester! Yes, Ranieri picked the team and motivated the players. Yes, Craig Shakespeare worked for hours on the training ground, fine-tuning the tactics of the perfect counter-attack. Yes, Jamie Vardy broke the record for scoring in consecutive matches. Yes, other players - described by too many people as "journeymen" - had the seasons of their lives. But it was Vichai who put all the right people in the right roles. It was Vichai who motivated them, who believed it was all possible, who told them to dream big. It was Vichai who made footballing fantasy, a reality.